The move to allow Java developers to appear in Spring certification without mandatory training has also encouraged the popular self-study model which is quite popular because even traditional Oracle Java certifications are based upon that. It allows programmers to prepare their own pace and its also not very expensive. All you need is a study guide and a Spring mock exam simulator. Even though you can use Spring framework books to prepare for certifications, but study guide is particularly important. The study guide has many benefits over general books e.g. they are focused on the certification exam. They fully cover all topics and have topic-wise assessment questions. They also do a good job on highlighting key concepts from exam point of view. If you want to do well on Spring certification, it is must that you choose a study guide for your preparation. You can also take help from Java Spring Framework 4 and Spring Certification, a course from Udemy, especially designed for Spring certification and currently they are offering 90% discount on that. Unfortunately, there are not many resources available to prepare for Spring certifications because it is still not that popular as compared to Oracle's Java certification. One reason for that was few developers opting for Spring certification due to expensive mandatory training. Now, that restriction is lifted you can expect more study guides, books, and mock exam will come to help Spring developer preparing by themselves for Spring certifications. Btw, If you are an experienced Java developer and using Spring framework for a couple of years and you think that you can pass Spring certification without much preparation, I suggest you to first go through David Mayer's Online Spring Mock test, It's a free test and if you can score over 80% then you are ready for the real exam. Anyway, here are a couple of useful study guides for Spring certification currently available in the market. This list includes study guides for Spring core, Spring web, and Spring Enterprise Integration certifications. 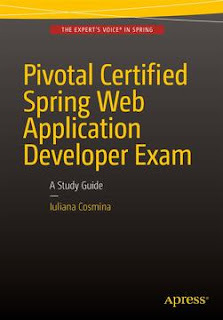 This is one of the best books to prepare for Spring Web application developer certification as it not only covers all topics but also teaches you essential concepts by keeping the exam and questions in mind. 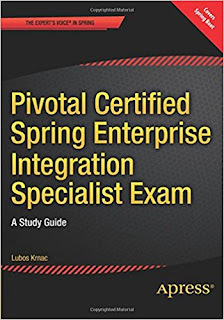 Pivotal Certified Spring Enterprise Integration Specialist Exam GuideThe Pivotal Certified Spring Enterprise Integration Specialist Exam: A Study Guide 1st edition by Lubos Krnac is one of the few resources which are available to prepare for this prestigious certification. Like any other study guide, this book also covered all exam topics required for Spring Enterprise Integration Specialist certification, which includes RESTful services with Spring MVC, tasks and scheduling, remoting, Spring web service, the Spring JMS module, JMS and JTA transactions with Spring, batch processing with Spring Batch and the Spring Integration framework. This is a proper study guide for Spring core certification. It covers all topics and essential concepts. It also has topic wise questions for Spring certification to prepare well. One book, which you can combine with Spring in Action to prepare really well for the exam. 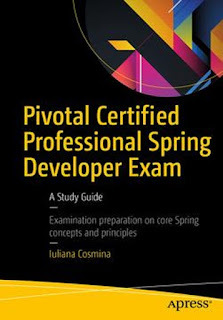 This is another free study guide from Pivotal which contains some must know information about Spring certification and topic wise questions to check your understanding. It just contains questions without any answer, but questions are good and you can also use them for preparing Spring interviews. If you are using Spring for a couple of years then you already know answers to most of them. They are also good to quickly check if you are ready for Spring certification or not because passing percentage is quite high for Spring certification. 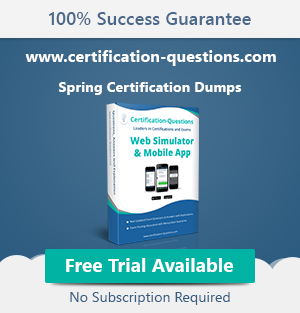 You need to get 38 out of 50 questions to pass the Spring certification. In general, If you can answer those questions along with David Mayer's online Spring Mock exam, then you are ready for the real exam. 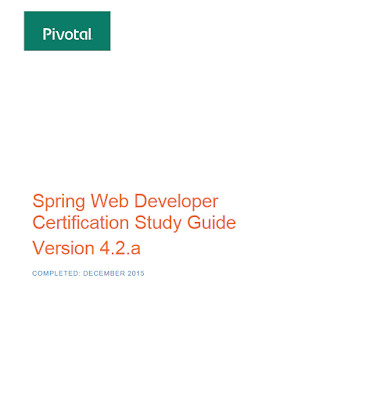 This is a free study guide for Spring Web application developer certification 4.2 version from the Pivotal itself. It contains some frequently asked question and information about the exam itself. It also contains questions which test whether you know the essential concepts or not. These Spring questions are also a good resource for an interview. That's all about some of the best resources to prepare for Spring certifications. We have looked at some of the best study guides available for Spring core, Spring web developer exam and Spring Enterprise Integration Specialist exam. I have also shared a couple of books to learn Spring framework in general before reading a study guide to focus more on exam topics. The study guide offers several benefit over conventional book e.g. they cover all exam topics and also have topic-wise quizzes, multiple choice questions to prepare better. Thanks for reading this article, if you find these resources useful then please share with your friends and colleagues. If you have any other resource which is useful for preparing Spring certification, then feel free to share with us. what about the spring 5 certification? Thank you Vojtech, your notes are really useful, thanks for sharing with us.